Anyone who’s ever tried to quit smoking, eat less or exercise more knows that changing personal habits is hard. Habits are the behavioral equivalent of mental heuristics—short cuts that allow our brain to chug along on autopilot. The more often we repeat a routine behavior, the less we need to think about it. That’s one reason why entrenched behaviors are notoriously difficult to change—they happen without thinking. 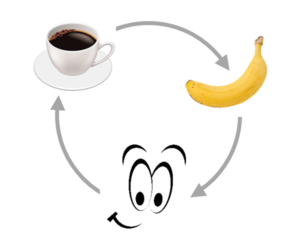 Habits are formed by a loop consisting of a reminder, a routine and a reward. The reminder serves as a cue for a specific behavior. Once we perform the routine behavior, our brain “rewards” us with a burst of the neurotransmitter dopamine. Over time, we learn to anticipate the reward as soon as the reminder appears. When it does, we experience a strong urge to perform the routine. For example, I have a habit of eating a chocolate bar every day with my coffee after lunch. 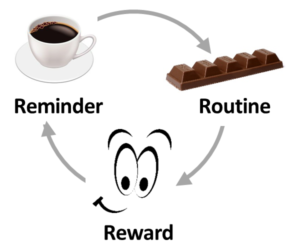 Coffee is the reminder, eating chocolate is the routine, and the rush of glucose (and dopamine) is the reward. This habit is difficult to extinguish! The mere presence of the reminder is enough to push me headfirst into the routine. Smell coffee? Eat chocolate! What could I do to kick the chocolate habit? The key to changing a habit is to substitute a different routine that provides the same reward. Substitution is easier than elimination. Smokers trying to quit know it is easier to eat a jelly bean when they have a craving for a cigarette rather than going cold turkey. Instead of eating a chocolate bar, I can substitute a healthier routine such as eating a banana—or going for a walk. The hardest part in breaking a habit is to identify the real trigger for the routine behavior. Is drinking coffee the trigger for my chocolate craving? Or is it seeing the shiny vending machines in the cafeteria? Sam is a team leader at an insurance company. With the precision of a Swiss watch, Sam appears in his deputy’s office each day at 5:30 pm and asks her how the day went. Sam’s behavior is motivated by good reasons—he wants to show that he cares and keep informed about her work. However, Sam’s habit of appearing at exactly 5:30 pm does not produce the desired effect. The deputy thinks Sam is checking when she leaves the office. Sam realizes that his management by walking around (MBWA) is not working. He reflects upon his habit and realizes that he has a desire to know what progress has been made at the end of the workday. The clock showing late afternoon is the reminder that triggers his inter-office peregrinations. Sam breaks the habit by substituting a different routine. Instead of visiting his deputy, Sam spends 15 minutes writing down what he has accomplished and his priority for the next day. The new behavioral routine of reflecting and planning provides the expected reward. The good news is that Sam is still free to visit his deputy. He just doesn’t feel compelled to do so every day at 5:30 pm. He may experiment with other ways to connect with his team. He might decide to visit a team member at a different time each day. Or he could plan a surprise ice cream break for the whole team. Clear, J. (2016). Transform Your Habits: The Science of How to Stick to Good Habits and Break Bad Ones, 3rd Edition. Retrieved from jamesclear.com. Graybiel, A. M. (2008). Habits, Rituals, and the Evaluative Brain. Annual Review of Neuroscience 31, 359-87. Schultz, W., Dayan, P., & Montague, P. R. (1997). A Neural Substrate of Prediction and Reward. Science 275, 14 March, 1593-99.